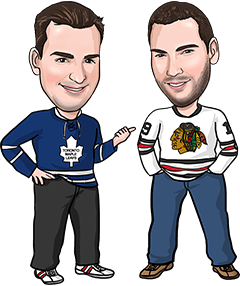 It’s a rare Friday post for our NHL betting tips today, but we’ll explain that in a second. The NHL bye weeks are upon us, with 15 teams going on their 5-day hiatus this week and another 16 poised to do so before the end of next week. As we mentioned yesterday, teams were awful coming out of their bye last year (check out our article on 2017 NHL bye week stats for more on that) and Arizona is in that position tonight against Edmonton. Recognizing that, the NHL made an effort this year to reduce the number of times a team came off its bye this year to face a team that hasn’t been sitting around for 5 days. Tomorrow, 6 of the 9 games will be between teams who are both coming off their byes. So rather than come out with a breakdown of the entire board Saturday when there’s so much uncertainty about how teams will play, we’ve chosen to post today and take tomorrow off. If we make any bets tomorrow, we’ll post them on Facebook and Twitter. One bet for us tonight after an 0-1 day yesterday. Good luck on whatever you’re on, and thanks for reading! Reasons to bet Vancouver: The Canucks have been much better on the road this year (9-9-3) than at home (7-12-3). Columbus has 1 regulation time win in its last 10 games and is playing for the second straight night and 4th in 6. Reasons to bet Columbus: The Blue Jackets are 15-7 at home. Vancouver has lost 9 of its last 10 games and is playing its 4th straight road game. Reasons to bet Calgary: The Flames have won 5 straight games, including a 5-1 rout of the Lightning last night in Tampa. Florida is playing its first home game following a 4-game road trip. Reasons to bet Florida: The Panthers have won 4 straight at home and are 6-2-1 in their last 9 overall. Florida hasn’t played since Tuesday while Calgary is playing its 3rd game in 4 nights. Reasons to bet Washington: The Capitals seek revenge for a 3-1 loss to the Canes last night in Washington. Carolina is playing its first home game in 10 days. Reasons to bet Carolina: The Hurricanes are 6-0-1 in their last 7 home games and have earned points in 14 of 18 home games overall (10-4-4). Washington is playing its final game before its bye week. Reasons to bet Winnipeg: The Jets are 6-0-1 in their last 7 games, scoring 4+ goals in all 6 of those victories. Chicago’s lost 7 of its last 9 home games versus Winnipeg, including all 3 last year. Reasons to bet Chicago: The Blackhawks have held 4 of their last 5 opponents to 2 goals or less. Winnipeg has lost 9 of 12 on the road. Reasons to bet Edmonton: The Oilers have won 4 straight meetings with the Coyotes, including a 3-2 OT win Nov. 28 in Edmonton. Arizona is playing its first game following its bye week. Reasons to bet Arizona: The Coyotes entered their bye week with a 3-2-1 record in their last 6 games. Edmonton has scored 1 regulation time goal or less in 6 straight games and has lost 7 of its last 8.